In the internet of things, the kitchen often seems to be the last room in the house to get some love. Garages, locks, pets and especially outlets are all getting some kind of radio and smarts via an app, but so far, cooking is left on its own. Maybe that’s because there aren’t open data standards for food or because the connected fridge burned people so badly. Or perhaps it’s because everyone who sees the kitchen has decided that the best connected device to launch is a connected scale. Adaptics, a company launching Monday afternoon, is no exception. It joins The Orange Chef (which raised $1.2 million from Google), Escali and others in offering a scale that connects to a smartphone running apps. 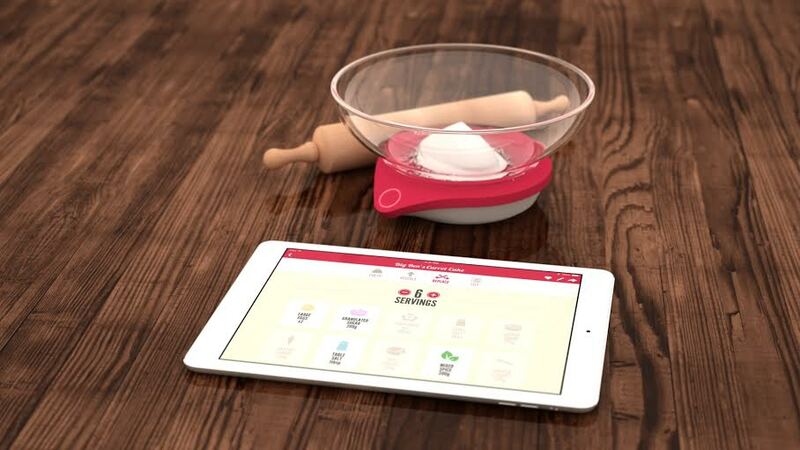 Like others, the Adaptics scale connects with an iPad (s aapl), a piece of technology already in use in many kitchens. The connected scale is an easy entry point into the kitchen because it solves two problems — it knows what food someone is placing on the scale (via the person identifying it or perhaps more exotic means) and how much there is. That makes it great for folks concerned about nutrition, but less great for people concerned with cooking. I would suggest products like connected thermometers or a spoon that measures viscosity (my dream) as being a bit more helpful. So the idea here is that the Drop scale measures your ingredients and then helps you adjust your recipe to adapt to the amount of flour or eggs that you have. It also suggests substitutions if a recipe calls for buttermilk and you realize you don’t have it. We don’t have pricing or availability yet, or a sense of how well this might play well with other products, but if you are into baking I suppose the Drop might be a fun gadget to have. Speaking as someone who is currently watching the status of a simmering soup via a remote camera above a pot on my stove, though, I’m hoping the connected kitchen gets a bit more sophisticated. And soon. Updated: This story was updated on Feb. 26 to note that Chef Sleeve and The Orange Chef are the same company. The problem with this device is that it offers very little upside versus a normal scale and an app where you just manually input the quantities. Feels like a forced product, connecting it for the sake of connecting it not to find find a solution to a problem. Making a Google Glass app that that does a lot more with no need for a smart kitchen would far more convenient,and with far more potential. And btw your dream spoon should maybe include a thermometer ( i imagine viscosity depends on temperature at least in some cases) but no real need for it to be connected either. Maybe it’s easy to do with a pressure sensor and an accelerometer able to determine viscosity when you stir – all i could come up with on the spot, there could be easier solutions. Hi realjjj, Jack from Drop here. Allow me to give a bit more information about how our connected scale works. The Drop iOS app includes a large collection of recipes in our uniquely visual format – no need for manually inputting quantities. The beauty is that you can adjust the size of the overall recipe by telling Drop how much of a certain ingredient you have. For example, the recipe might call for 4 eggs but you only have 3 – no problem! Drop scales all other ingredients to the exact weight of eggs you have. Hope this helps clear things up a little. I cook and would totally use this over a spoon for viscosity measurement (what the fauck is this journalist smoking?) This scale combined with a connected thermometer and other accessories would be amazing for providing awareness when I’m cooking/baking non-trivial dishes.